Links between Team Van Oord and the University of Brighton continue to strengthen, with a delegation of first year civil engineering students visiting the Shoreham Adur Tidal Walls in December. The £31m flood defence scheme is being carried out by Team Van Oord on behalf of the Environment Agency, Coast to Capital Local Enterprise Partnership, Adur District Council and West Sussex County Council. 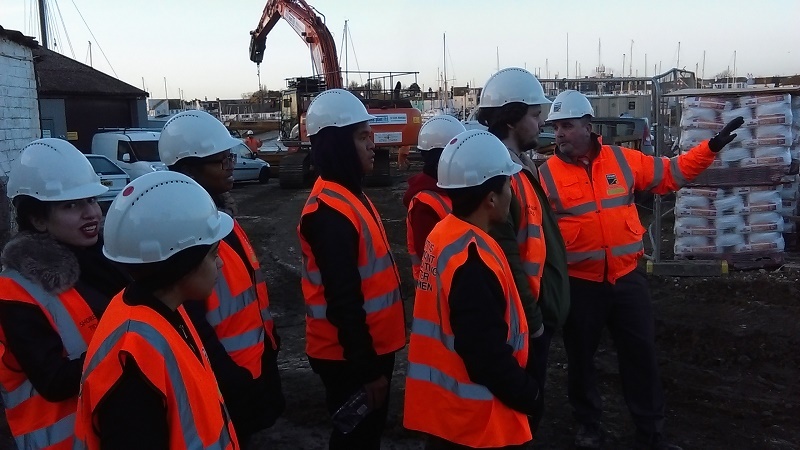 The student visit, which comprised a briefing followed by a tour of the works that are currently taking place, is the latest in a long line of similar events – the most recent of which took place at the Clay’s Lake Flood Prevention Scheme in West Sussex in October. Once completed, the Shoreham Adur Tidal Walls scheme will significantly reduce flood risk to more than 2,300 properties in Shoreham and East Lancing, as well as protecting important local infrastructure such as the road network, railway line and Shoreham Airport. The scheme is separated into 10 reaches, or lengths of the estuarine bank. The design of the flood defences varies between the reaches as they have different characteristics and are subject to different pressures and potential flood impacts. The defences include steel sheet piling, concrete walls, flood glass and earth embankments.